Objectives: The main objective of this study was to investigate the molecular diversity of α- subunit of bacterial Ring Hydroxylating Dioxygenases (RHD) in agriculture soil. These enzymes catalyze break down of polyaromatic hydrocarbon to non-toxic form without forming harmful products like 3-PBA (3-Phenoxybenzoic acid). To meet our objectives, we carried out PCR amplification, cloning and analysis of genes encoding partial catalytic domain of α-subunit of phenanthrene (phn) RHD genes from metagenome sample of agricultural soil. Methods: Partial sequences of RHDs were amplified from soil metagenome using degenerate set of primers. A library of ~25 clones was generated by cloning PCR amplified product in pGEM-T easy vector using E. coli Dh5 α cell as host. Plasmid DNA was extracted from recombinant clones using plasmid DNA extraction kit followed by sequencing of positive clones. Phylogeny analysis of the recovered clones was carried out using Mega programs version 7.0. Several bioinformatics tools were used to predict the active site cleft and active site complementarities of RHDs towards various aromatic hydrocarbons. Results: Selective PCR amplification of alpha subunit of bacterial RHDs and its cloning thereafter resulted in a library consisting of 25 clones. Notably, sequencing of these clones demonstrated the presence of four sequences, encoding RHDs. These sequences were grouped into three main clusters. Among four sequences encoding RHDs, one sequence shared ~ 76 % similarity to reported RHD protein (PDB ID: 2GBW). In silico molecular modelling and analysis revealed that active site residues in this sequence were conversed except Gly205Ala mutation in the conserved domain (Glu209-His217). 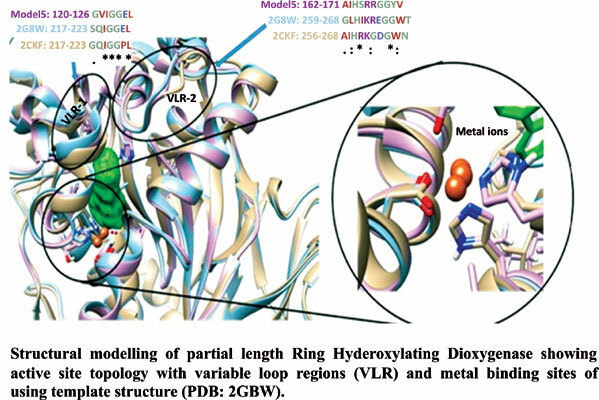 Comparative analysis of the predicted model displayed a significant level of variations in the binding site (at the entrance of loop regions Ala259-Val268). In silico characterization of the substrate binding site with chemical probes demonstrated binding preference of active site towards various polyaromatic hydrocarbons. Metagenomics, ring-hydroxylating dioxygenase, pollutants, cypermethrin, metal, pesticides.